“100 Destinies” 2015. 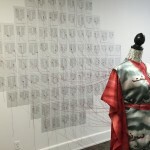 Silk and mixed media installation. About the installation: Following an old Persian tradition, I consulted the 14th century mystic poet Hafez about my future by opening a book of his poetry: a divination practice called “bibliomancy.” The installation includes Hafez poems collected over 100 consecutive days, and a hand-painted silk garment with the Farsi word for destiny, “Sar-Nevesht,” in repeat pattern, with connecting threads to each poem. I invited viewers to ask questions about their own destiny, and seek the answer in a Persian-English translation.